Our Abpromise guarantee covers the use of ab36121 in the following tested applications. Component of the Wnt-Fzd-LRP5-LRP6 complex that triggers beta-catenin signaling through inducing aggregation of receptor-ligand complexes into ribosome-sized signalsomes. Cell-surface coreceptor of Wnt/beta-catenin signaling, which plays a pivotal role in bone formation. The Wnt-induced Fzd/LRP6 coreceptor complex recruits DVL1 polymers to the plasma membrane which, in turn, recruits the AXIN1/GSK3B-complex to the cell surface promoting the formation of signalsomes and inhibiting AXIN1/GSK3-mediated phosphorylation and destruction of beta-catenin. Appears be required for postnatal control of vascular regression in the eye. Required for posterior patterning of the epiblast during gastrulation. Widely expressed, with the highest level of expression in the liver. Defects in LRP5 are the cause of vitreoretinopathy exudative type 4 (EVR4) [MIM:601813]. EVR4 is a disorder of the retinal vasculature characterized by an abrupt cessation of growth of peripheral capillaries, leading to an avascular peripheral retina. This may lead to compensatory retinal neovascularization, which is thought to be induced by hypoxia from the initial avascular insult. New vessels are prone to leakage and rupture causing exudates and bleeding, followed by scarring, retinal detachment and blindness. Clinical features can be highly variable, even within the same family. Patients with mild forms of the disease are asymptomatic, and their only disease related abnormality is an arc of avascular retina in the extreme temporal periphery. EVR4 inheritance can be autosomal dominant or recessive. Genetic variations in LRP5 are a cause of susceptibility to osteoporosis (OSTEOP) [MIM:166710]; also known as senile osteoporosis or postmenopausal osteoporosis. Osteoporosis is characterized by reduced bone mass, disruption of bone microarchitecture without alteration in the composition of bone. Osteoporotic bones are more at risk of fracture. Defects in LRP5 are the cause of osteoporosis-pseudoglioma syndrome (OPPG) [MIM:259770]; also known as osteogenesis imperfecta ocular form. OPPG is a recessive disorder characterized by very low bone mass and blindness. Individualy with OPPG are prone to develop bone fractures and deformations and have various eye abnormalities, including phthisis bulbi, retinal detachments, falciform folds or persistent vitreal vasculature. Defects in LRP5 are a cause of high bone mass trait (HBM) [MIM:601884]. HBM is a rare phenotype characterized by exceptionally dense bones. HBM individuals show otherwise a completely normal skeletal structure and no other unusual clinical findings. Defects in LRP5 are a cause of endosteal hyperostosis Worth type (WENHY) [MIM:144750]; also known as autosomal dominant osteosclerosis. WENHY is an autosomal dominant sclerosing bone dysplasia clinically characterized by elongation of the mandible, increased gonial angle, flattened forehead, and the presence of a slowly enlarging osseous prominence of the hard palate (torus palatinus). Serum calcium, phosphorus and alkaline phosphatase levels are normal. Radiologically, it is characterized by early thickening of the endosteum of long bones, the skull and of the mandible. With advancing age, the trabeculae of the metaphysis become thickened. WENHY becomes clinically and radiologically evident by adolescence, does not cause deformity except in the skull and mandible, and is not associated with bone pain or fracture. Affected patients have normal height, proportion, intelligence and longevity. Defects in LRP5 are the cause of osteopetrosis autosomal dominant type 1 (OPTA1) [MIM:607634]. Osteopetrosis is a rare genetic disease characterized by abnormally dense bone, due to defective resorption of immature bone. The disorder occurs in two forms: a severe autosomal recessive form occurring in utero, infancy, or childhood, and a benign autosomal dominant form occurring in adolescence or adulthood. OPTA1 is characterized by generalized osteosclerosis most pronounced in the cranial vault. Patients are often asymptomatic, but some suffer from pain and hearing loss. It appears to be the only type of osteopetrosis not associated with an increased fracture rate. Defects in LRP5 are the cause of van Buchem disease type 2 (VBCH2)[MIM:607636]. VBCH2 is an autosomal dominant sclerosing bone dysplasia characterized by cranial osteosclerosis, thickened calvaria and cortices of long bones, enlarged mandible and normal serum alkaline phosphatase levels. Contains 20 LDL-receptor class B repeats. Phosphorylation of cytoplasmic PPPSP motifs regulates the signal transduction of the Wnt signaling pathway through acting as a docking site for AXIN1. Membrane. Endoplasmic reticulum. Chaperoned to the plasma membrane by MESD. ab36121 at 1ug/ml staining LRP5 in human pancreas tissue section by Immunohistochemistry (Formalin/PFA fixed paraffin-embedded sections). Tissue underwent antigen retrieval in microwave and in Tris/EDTA buffer (pH 9). 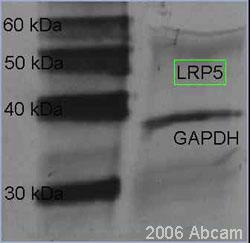 HRP-staining procedure was used for detection. ICC/IF image of ab36121 stained HepG2 cells. The cells were 4% formaldehyde fixed (10 min) and then incubated in 1%BSA / 10% normal donkey serum / 0.3M glycine in 0.1% PBS-Tween for 1h to permeabilise the cells and block non-specific protein-protein interactions. The cells were then incubated with the antibody (ab36121, 1µg/ml) overnight at +4°C. The secondary antibody (green) was Alexa Fluor® 488 donkey anti-goat IgG (H+L) used at a 1/1000 dilution for 1h. Alexa Fluor® 594 WGA was used to label plasma membranes (red) at a 1/200 dilution for 1h. DAPI was used to stain the cell nuclei (blue) at a concentration of 1.43µM. ab36121 staining LRP5 in Human kidney tissue at a concentration of 4 µg/ml by Immunohistochemistry (Formalin/PFA-fixed paraffin-embedded sections). Steamed antigen retrieval with citrate buffer pH 6.0 was performed, and the antibody was detected with HRP-staining. Publishing research using ab36121? Please let us know so that we can cite the reference in this datasheet. Sorry, I forgot to ask you about the antigen retrieval agents suitable for these antibodies for paraffin embedded slides. Will you please advise me and give the catalogue numbers. Are they compatible between each other, since I am going to use many antibodies on the same slide. Thank you for contacting us with your question. I believe my colleague has already been in touch regarding your other enquiry, but I'll be happy to help with the technical question. Each of these antibodies has been shown to be compatible with various antigen retrieval methods. Ab9498 can be used with pepsin, trypsin, or heat-induced retrieval in pH6 citrate buffer. Ab36121 can be used after heat-induced retrieval in tris-EDTA or in citrate buffer. Ab77854 does not require a pre-treatment step, but in the literature (see attached) it has been used following heat-induced retrieval with citrate buffer. I hope this information will be useful, but please let me know if you have any further questions or if there is anything else that we can do for you, and I'll be happy to help.